RV EDGE is located at 2 SHANGHAI ROAD in district 10 (Bukit Timah, Grange, Holland) of Singapore. RV EDGE is a Freehold Condo development consisting of 108 units. RV EDGE is completed / TOP in 2013 (estimated), developed by FORTUNE ESTATE PTE LTD.
Educational institutions like ISS ELEMENTARY & MIDDLE SCHOOL, MANASSEH MEYER SCHOOL, SRI MANASSEH MEYER INTERNATIONAL SCHOOL, RIVER VALLEY PRIMARY SCHOOL, ZHANGDE PRIMARY SCHOOL and GAN ENG SENG PRIMARY SCHOOL are near to RV EDGE. RV EDGE is accessible via nearby TIONG BAHRU, ORCHARD and SOMERSET MRT Stations. Excellent location, very close to Orchard and has a small and a large shopping mall (Great World City) within walking distance. Many supermarkets and eateries around. We have just moved into a 1 bedder unit. It is of a good size for us (husband and I). It seems bigger than the other 366sqft unit at other development. Perhaps is well designed. Having viewed several units at RV Edge, we end up choosing the pool facing (inner facing). Although we are directly facing the opposite unit, from side view, dont really see each other. The good thing of choosing the inner facing unit is there is no WEST or EAST sun and almost zero noise! Very good place to rest after back from work. Furthermore, with great world city nearby, and lots of restaurants in the area, i would think the convenience is full mark. not to mention orchard road paradise is just few minutes away. We have signed 2 years tenancy, and i think the price is good and reasonable. During weekends, we just chill at the pool/jacuzzi area. 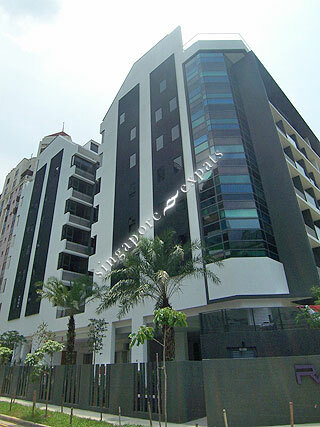 Great Location - easy access to CBD / Orchard, walk to amenities and Great World City Mall. Excellent for singles and couples.